Jaipur : As many as 1100 saplings will be planted at the world renowned Elephant Village – also popularly known as ‘Hathi Gaon’. The plantation drive today began with the Rajasthan Minister of State for Tourism (Independent Charge), Krishnendra Kaur (Deepa) planting the sapling at the village. 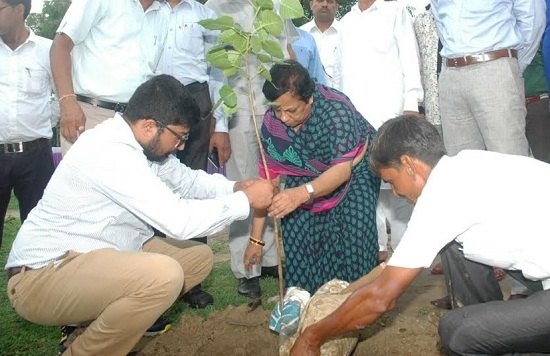 Later, more such saplings were planted by the senior officers of the Department and members of the ‘Elephant Welfare Association’ (EWA). Also present on the occasion were the Director Tourism, Ashutosh AT Padnekar and other senior officers. The Secretary of the EWA, Rashid Khan was also present. On the occasion the Minister directed the officials and members of the EWA to ensure proper upkeep of the saplings. The Director informed that presently 51 elephants were housed in the village – and 12 more elephants were being added. Appropriate steps are being taken to develop the Elephant Village as a tourist site in Jaipur, he added. It is to be recalled that that the Elephant Village was developed in 2007 in an area of around 102 bigha land in Kunda off Jaipur-Delhi highway. Around 30 families of the elephant owners live here.